More like out, out, baseballs. Jason Varitek continued to produce in his part-time role by going 2-for-3 with a home run, four runs batted in, and two walks. David Ortiz benefited from his long talks with fellow southpaw Adrian Gonzalez and jolted his 16th longball of the season. His three-run homer in the fifth inning capped off a seven-run onslaught. That’s like Derek Jeter saying something like, “If Gonzalez hit less fly balls like me he wouldn’t get as many fly ball outs as he does.” The only reason that Jeter hasn’t been dropped in the batting order is because of his pursuit of the 3,000 hit mark that the Yankee management seems desperately attempting to engineer so that it occurs at Noveau Stade Fasciste. Luongo gave up eight goals on 38 shots in Game 3 and four goals on 20 shots in Game 4 when he was finally pulled in favor of Cory Schneider. Luongo’s save percentage during the Canucks’ playoff run is .919. In stark contrast, Thomas’s save percentage is .937. Perhaps the Canucks players should stop making so many difficult shots on goal for Thomas to kill. 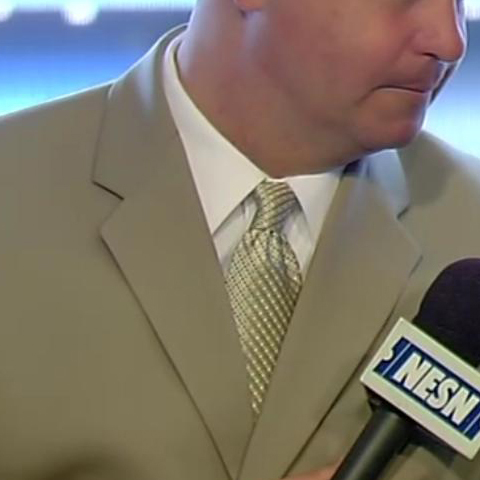 Another tie trend of Don Orsillo’s I’ve noticed besides blue is a recent proclivity towards gold. Perhaps this is to show support for the Bruins since he hasn’t grown his playoff beard as Tom Caron has.